Far from being something to bulk out your barbecue, hot dogs can be loaded up with delicious toppings to make them the star of the show, and let’s face it; they’re a good excuse to get messy. I always use Chicago-style jumbo frankfurters rather than a standard pork sausage; for me, a proper dog is all about that slightly squeaky exterior and dense, smoky filling. 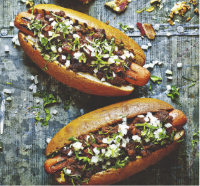 Hot dogs hardly need any cooking – just a quick flash over the coals to heat them through – so you can put a bit of time and effort into making these awesome toppings. This recipe is from Fire and Smoke by Rich Harris. 1. Heat a little oil in a heavy-based casserole, add the chorizo and fry gently for 5 minutes until crisp. Set a sieve over a bowl and tip the chorizo in; you’ll end up with some chorizo oil in the bowl. 2. Pour half the collected oil back into the pan, crank the heat up and add the beef. Fry for 5 minutes until golden brown and starting to turn crisp, then tip into the sieve with the chorizo. 3 Return the remaining oil to the pan, add the onions and fry for 10 minutes until soft and caramelised. Add the garlic and spices and cook for a further 2 minutes. Add the tomato purée and fry for 2–3 minutes, then pour in the chopped tomatoes and hot stock and bring to a simmer. 3 Return the chorizo and beef to the pan, drop in the ancho chilli and simmer gently for 11⁄2 hours, stirring occasionally. Add the beans and cook for a further 30minutes.Removefromthe heat and adjust the seasoning. 4. Preheat the barbecue for direct grilling. Grill the sausages for 6–8 minutes until warmed through and lightly charred, turning regularly. Move them to one side of the grill and then lightly toast the cut side of the rolls. 5. To assemble, spread the insides of each roll with mustard and lay a sausage on top. Spoon over some of the chilli and finish with plenty of onions and coriander.